Many of you wonder which beliefs to follow. You do not need holy books to find me. In the animate and the inanimate. I am a verb and I am a noun. I am female and I am male. I am mystical and I am mundane. I am supernatural and I am flesh and blood. Trying to find what he could not see. Trying to give voice to a vastness beyond his grasp. My emanation does not arise from books. Or volumes of instructions interpreted by man. 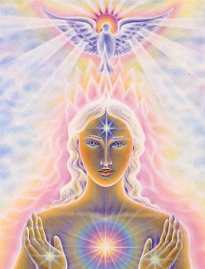 I am in the Higher Consciousness of mankind. And you will find me there. I am *The Place, wherever you are on your journey. The integrity of your work. My words are inside of each of you. In your own unique manner. As long as you are sincere. Your humanity is my voice. Your sacredness personifies my presence. The asterisked words are some of many Hebrew names for God. *The Place ~ HaMakom (Hebrew). *Without End/The Infinite ~ Ein Sof (Hebrew). *The Fountain of Living Waters ~ M’kor Mayyim Chayim (Hebrew). *I am that I am/ I will be that which I will be (and variations) ~ Ehyeh-Asher-Ehyeh (Hebrew). God self-identified to Moses by this name (Sh’mot/Exodus 1:1 – 6:1) – in essence saying Divinity is fluid, evolving and in a constant state of becoming. Godding is an unfolding process manifested through human beings. Thanks for sharing. These are deep thoughts that I need to return to a few times to fully appreciate. What a timely post! Words flow through like magic. Beautifully written! I had to check this out for it is the title of a beautiful book I read a while back on the mystical Kabbalah. The author was a Rabbi from Colorado, first name David, can’t remember the last. So much to reflect on in your words too. Thank you for reading and commenting Victoria. I love Kabbalah. I need to read that book! Lovely words and and wishes the same goes to you my dear! Hi, I was drawn to your blog through Dverse and then your Name. Then I read this. I think you have created something very special here. Thank you for sharing. This is true poetry and I feel your message in my bones. This is very thought-provoking and inspiring poem – so beautifully written. Thanks, MW! A very timely writing for many people Sue, the question of beliefs and Religion seem to have become a Political subject these days, even our recent Census needs the question marked, this time they allow for a No Religion response, Everyone believes in something, even atheists, for they believe in no God which in itself become a belief. I think I will stick to my beliefs, Me, Myself, My Spirituality and My God. Thank you for your recent visit and comment on my blog! I am glad that I found this work of yours and will enjoy exploring your beautiful blog. All the best to you! It is as if I’m reading whole Geeta in your poem! Insightful and quick connection to soul! amen, MW! you are most welcome! This whole entire poem is wisdom and so spiritually uplifting. These fine words so eloquently rendered draws one ever closer to their true nature, an intimate relationship with spirit. Beautiful post, thank you for sharing this with us, as I easily can relate with. Beautiful musings on the vastness and mysteries of God. Thanks. Beautiful.. and I thank you that you republished this or I would not have read these words which echo my own thinking. May I reblog this wonderful post WM? I always believed that God is not a “person” but rather nature. That we carry as much of “God” in us as there is around us. Mother Wintermoon wrote this beautiful expression of her spirituality as well as that of many others. So much depth of understanding of the search mankind has had for so long. You show so much knowledge through your words. You have studied religion extensively I’ll bet.. I love this “I am” poem. So beautiful and sums up spirituality quite well. Though I realize there is much more that I don’t know. Thank you for such inspiration. I don’t usually reblog but this one speaks volumes to me. Please check out mother wintermoon’s original version and “like” it there. Also see her about page. This kind lady is definitely worth a follow. Many thanks and much appreciation, kind sir. It’s so lovely to speak soul-to-soul and interconnect. I simply must reblog this for a bit and bring people to you. This is very very good Momma! WOW! Mine too! See my about page lol! !